I've been holding out on you all, and haven't posted pictures of our master bedroom yet. Well, I'm finally going to share (part of me had a hard time getting the pictures how I wanted, part of me forgot that I took them! 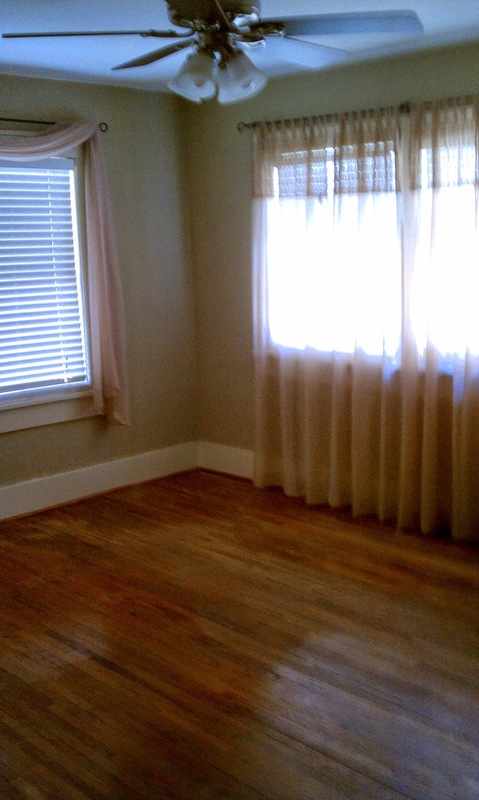 ), but I'm ready now and excited to show you our master bedroom. It was actually one of the first rooms that we completed. I hate when people leave their special oasis until the very end to decorate and leave it blah. This your space people! If you haven't decorated your bedroom how you'd like it, at least go get a new comforter or paint the walls or hang a pretty picture - something to make it yours. It's where you have to wake up and face the day and I don't know how you get going if it has no inspiration. Granted, mine usually is a little messy with clothes, but I'm working on that! Lucky for me, emerald was the color of the year last year! The trunk was my grandmother's, which I love because it adds old character. Plus, it gives me a spot to store out of season clothing. The fun elephant prints are from Parima Studio. 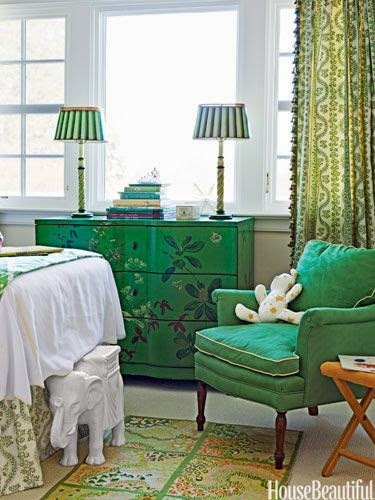 The seagrass headboard and cute yellow side table were great Target finds. On both, I waited for them to have a special - love getting a deal! The accent pillows, I found when living in Singapore and went shopping in Little India - love working my travels in my decor. This adorable side table was found in an antique shop by Dustin's grandparents and we gave it a refresh with white spray paint. The green lamp was also an antique store find (love going to the store in Liberal with his grandparents!) and it was only, wait for it... $8!!! We did have to mess with the electrical components to get it working better, so that was sort of a pain, but we figured it it didn't work out, we were out $8. Dustin spray painted a file rack gold to hold his books and magazines. This was a fun find that Dustin and I purchased in Thailand - love the colors against the green! Plus, I love that it ties in the elephants. This gorgeous beauty, we also found at an antique store in Liberal. We purchased it for $130. We can't decide if we want to paint it, or just re-stain it. Even though we chose a darker color for our room, it still brightened it up! The beige dulled the room against the wood work, so it needed a splash of color. Your bedroom is your space, so make it how you want it. It's the one room in your house that you can make your own. Also, gender friendly bedrooms do not have to just be neutral. Find colors that you both love and you can make it work. I think that green, navy and yellow can be very gender friendly colors. I also prefer cooler colors (blues, greens, purples) for bedroom walls because you want it to be a calming space. We still have a little work to do with the floors and I would love to find a great chair, but for now it works and we love how it looks! I also love how we have personalized it with artwork and antiques. Definitely reflects us.